This guide covers weather and traffic solutions for broadcasters, ranging from touchscreens that can help enhance coverage to complete weather systems with enhanced mapping and graphics capabilities. With elections on the mind of many stations, AccuWeather is highlighting some of the extended features of its StoryTeller touchscreen solution, including CampaignTrail. Throughout the entire election season, cover county-by-county, state-by-state, or even congressional district elections with up-to-date coverage with CampaignTrail. It comes complete with detailed North American voting maps and graphics and can also automatically ingest election results from all major election data providers for live, on-air updates. AccuWeather will also feature the latest updates to StormDirector+ and DriveCast. Baron is unveiling their new comprehensive traffic system for news and weather with the introduction of Baron Traffic as part of the powerful Baron Lynx display system. Baron Traffic provides a completely integrated, one vendor solution that is based on high-resolution mapping and flexible graphics. Utilizing the streamlined interface already within Lynx, Baron traffic will provide speed-to-air, traffic flow, drive times, incident accuracy and weather overlays to power the system. The system provides timely and accurate traffic flow data, accident information and drive time information based on road segments and easily integrates traffic cameras. Baron Traffic provides a solution that is quick and easy to get to air with stunning graphics and easily shareable on social media. This powerful comprehensive solution will drive business with numerous sponsorship opportunities. In addition to Baron Traffic, the Baron Lynx weather system continues to expand its capabilities for weather visualization, exclusive weather content and Hand Tracking with the 2018 NAB software release. Baron Digital Solutions 2018 updates include a new white label app design with additional customization and advertising options to enhance broadcasters’ bottom line. Brainstorm Multimedia will feature the latest in its Aston and eStudio family, which can create sophisticated weather graphics. For the election, Brainstorm will also focus on AstonElections, its cost-effective and extremely user-friendly, template-based intuitive application intended for graphics coverage for broadcast elections. ChyronHego will show the latest updates in its end-to-end production workflow, part of the Camio Universe. Metacast, ChyonHego’s data-driven weather solution, features a template-based workflow to make the creation and delivery simple and efficient. The Weather Company, an IBM business, will have cognitive digital solutions at the forefront of its solutions this year, bringing the power of AI and Watson to weather and traffic. Highlights will include the latest updates to its media solutions including its Max Ecosytem. Weather Metrics sets the standard in customized live video streaming, software and support solutions. 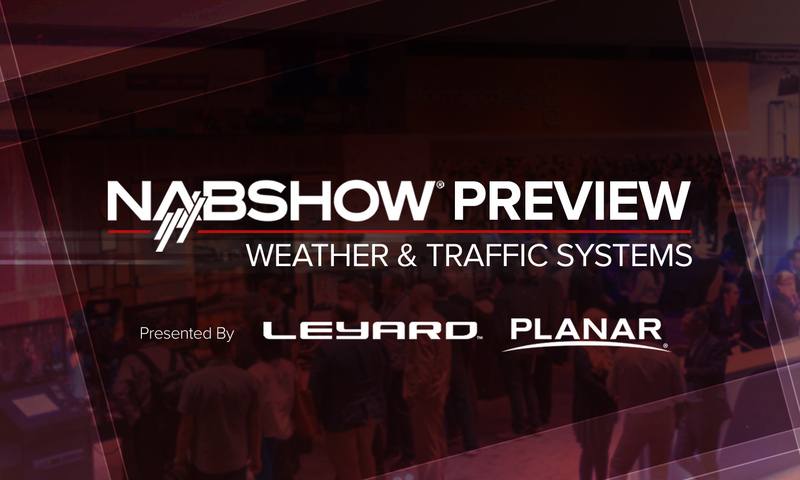 During the NAB Show, the company will showcase its WeatherVision, StreamVision and FlexChannel technology for local broadcasters. Vizt’s NAB Show booth will feature an array of broadcast production solutions including Viz World, a map creation tool that includes traffic data and social media integration.